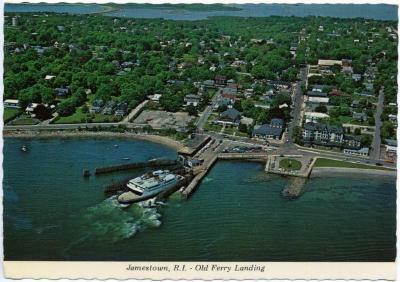 A postcard depicting an aerial view of the ferry landing in Jamestown. Copyright John T. Hopf. 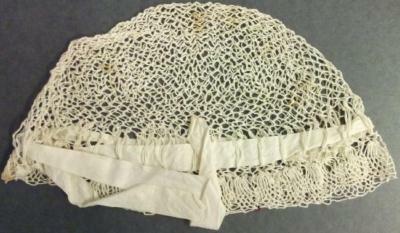 A white net cap bordered with a band of white ribbon. Owned by Mrs. T.E. McLaughlin (Georgia Bright McLaughlin) of Newport, R.I.
Black and white picture. There is a dock center with seven ships docked to the right and eight docked to the left, several different sizes. 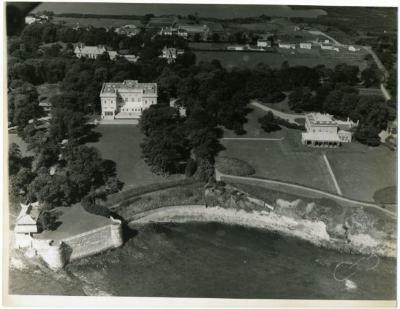 There is a parking lot at the front of the picture. 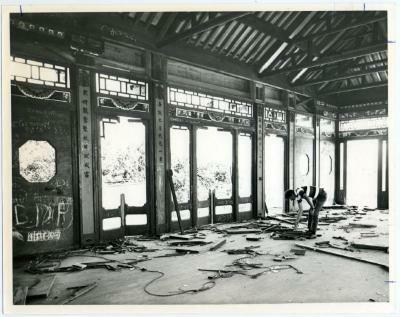 Channing Church kitchen after fire. Gadsden flag with yellow field and all black snake and lettering. 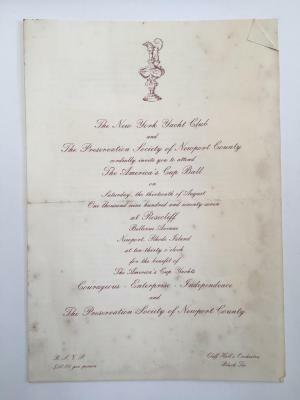 Stamped by Ebenezer Flagg on white border. One architectural drawing of the Tennis Hall of Fame. It has the look of a fascimile. 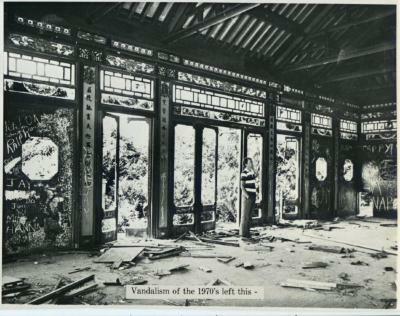 The drawing is a view of the exterior. 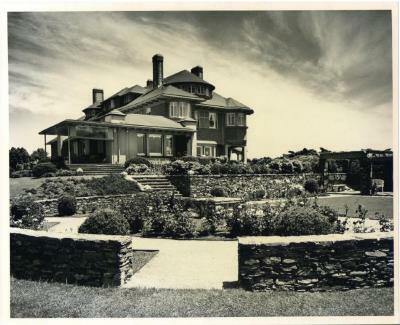 6 architectural drawings of the Burnett Residence on Poplar Street. 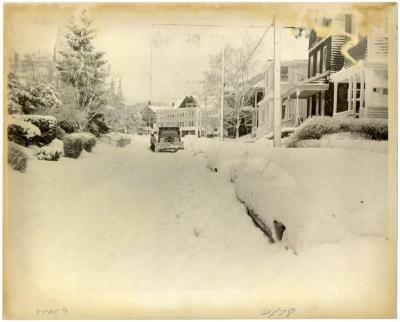 A photograph depicting a plow moving up an unidentified snow-covered street after the Blizzard of 1978. 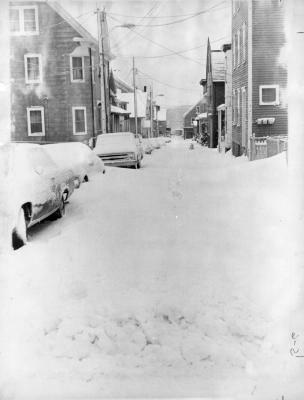 A photograph depicting a snow-covered Ayrault Street after the Blizzard of 1978. 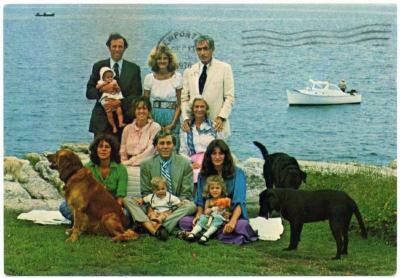 Caption at bottom reads "AYRAULT 2/78". 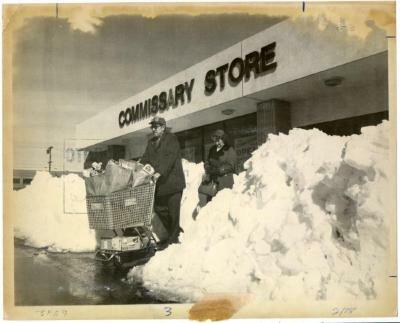 A photograph depicting a woman and a man with a shopping cart exiting the U.S. Navy Commissary Store after the Blizzard of 1978. 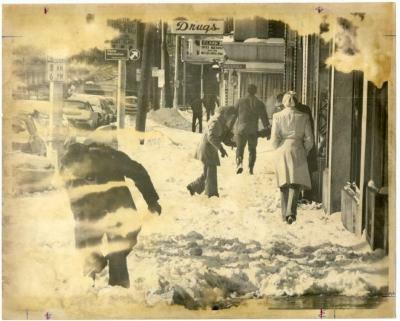 A photograph depicting Brewer Street looking towards Thames Street after the Blizzard of 1978. Achilles tanker near the Mt. Hope Bridge. 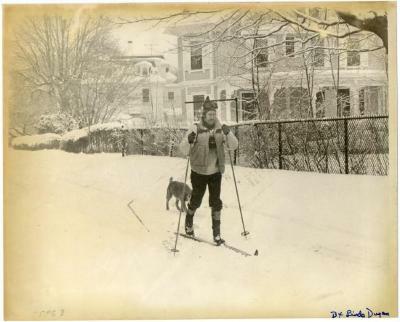 A photograph depicting a man cross-country skiing down an unidentified street. 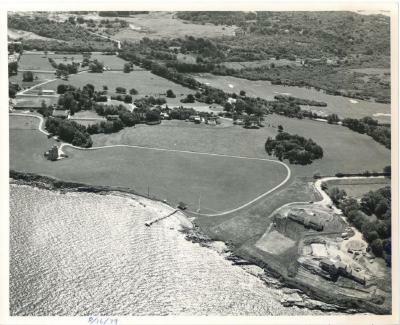 A dog is following directly behind him; houses are visible at right. 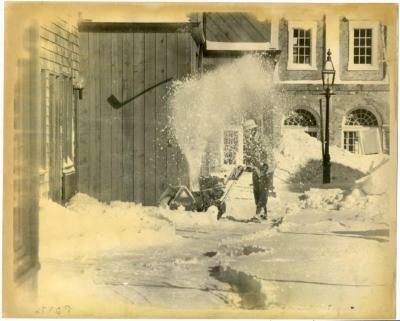 A photograph depicting snow removal at the Brick Market Place shopping center on Thames Street. 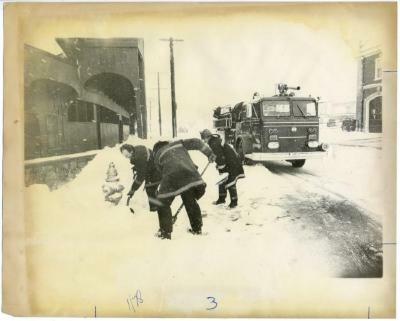 The Brick Market building is visible in the background. 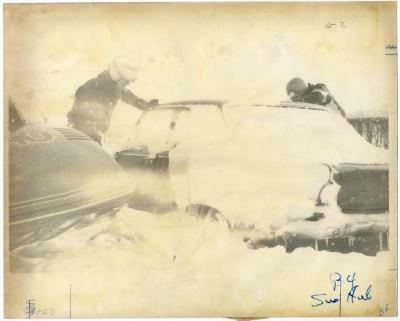 A photograph depicting police examining a snow-covered car after a snowstorm. 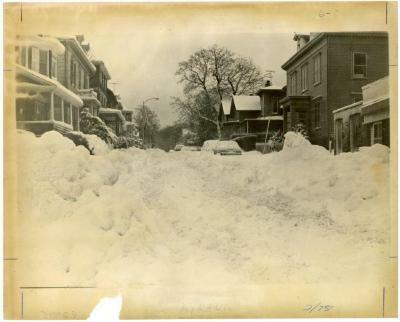 A photograph depicting children playing on a snow-covered street after a snowstorm. 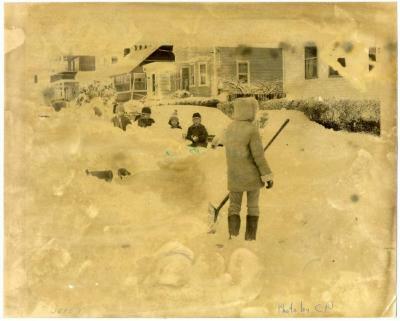 A woman is seen at foreground holding a shovel. 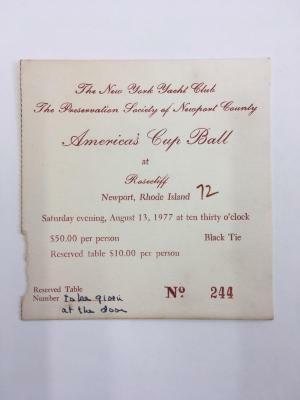 Handwritten text reads "Photo by CP." 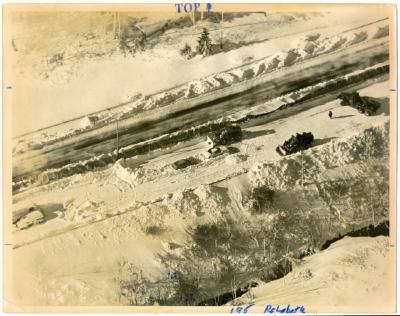 A photograph depicting an aerial view of a snow-covered highway in Rehoboth. 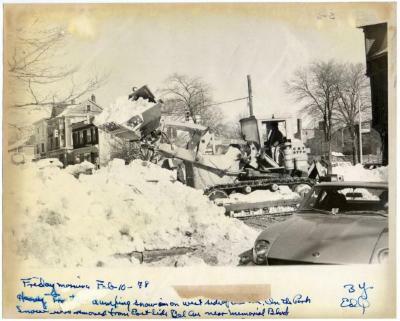 Stranded cars, as well as plows, are visible. Bottom of an invitation on cardstock with light blue type. 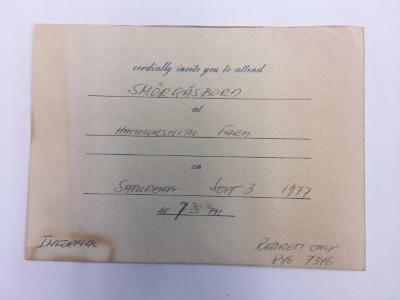 Details are handwritten on pre-printed lines, invitation to a Smorgasbord at Hammersmith Farm on Saturday, Sept. 3, 1977 at 7:30pm. Off-white card with black type. 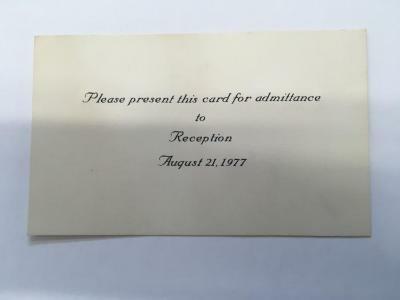 Card reads, "Please present this card for admittance/to/Reception/August 21, 1977."